An open-source text substitution tool for Windows. Combos are text shortcuts associated with a substitution text. 2. Perform your combos in any application. Beeftext works in any application that supports copy/paste. Are you tired of repeatedly typing the same text over and over again? The custom email signature you only use for your close friends. The markdown snippet you use 5 times a day. The text emoji you like so much (\/) (°,,,°) (\/). Beeftext is made for you. Beeftext allows you to define combos. A Combo associates a short word that you are unlikely to type in a normal situation (a keyword) with a piece of long or complex text you often need to type (a snippet). From now on, every time you type the keyword, in any text area of any application that support copy/paste (99.9% of them do), the combo is triggered and Beeftext automatically replaces the keyword by its associated snippet. Thanks to Unicode encoding, this text can be in any language, using any kind of characters, even exotic ones. Text substitution tools are not new. Beeftext exists because on the windows platform, the existing solution are either expensive, closed-source, unmaintained, complex to setup, or any combination of those. Beeftext is free - as in free beer - and contains no ad nor malware. You can verify that because Beeftext is open-source. The source code for the application, its installer and even this web page is hosted on GitHub. To perform its jobs and be able to work everywhere, Beeftext 'listens' to your keystrokes. Beeftext is notified of every keyboard (and mouse) interaction, as long as the program is running. But Beeftext does not store any information related to your typing, and absolutely no data is sent to any server for whatever reason. 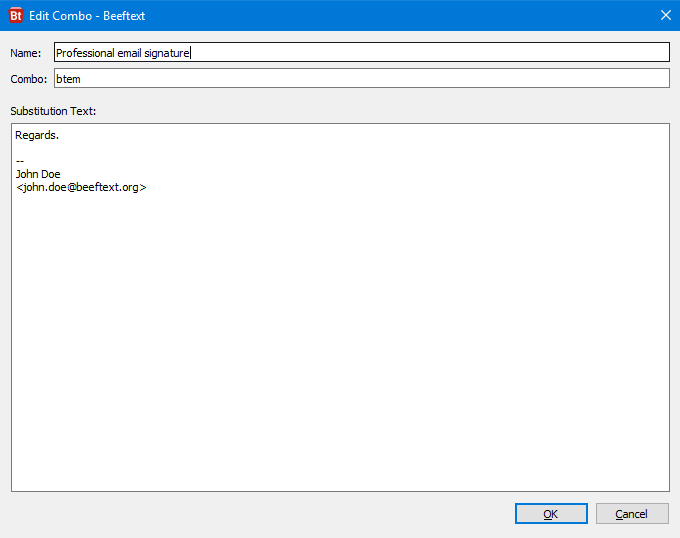 The only network activity performed by Beeftext is a daily download of a text file from the Beeftext website to check if a newer version of the application is available. This feature can be disabled in the application preferences. Beeftext is still in an early phase of its development. Bugs can occur and the author will do his best to fix them. Do not hesitate to report them in the issue tracker on our GitHub project page. A lot of new features are planned for future releases. You feedback is appreciated and will be extremely useful to shape the future of Beeftext. Do not hesitate to tweet us your remarks, concerns and support.